Bunong traditional musical instruments play a very important role in their daily life. If these instruments are not used in the proper way in accordance with Bunong tradition, it causes people in their family or their community to become sick. This is the reason why Bunong people believe that “there are spirits residing in those instruments”. Some traditional events have to make use of these musical instruments and some of these instruments have to have a celebration ceremony for either the spirits of these instruments or the spirits of their ancestors who owned these instruments before they can be used. Nevertheless, some instruments are used to spur Bunong parties to be happier events. Each instrument is used in specific ceremonies and they each have their own function. The instruments are named in the Bunong langauge, none of them are named in Khmer. Nong, Mapoartt, Rahome and Kong Reng are produced by Bunong people. Choeng and Gong are imported. 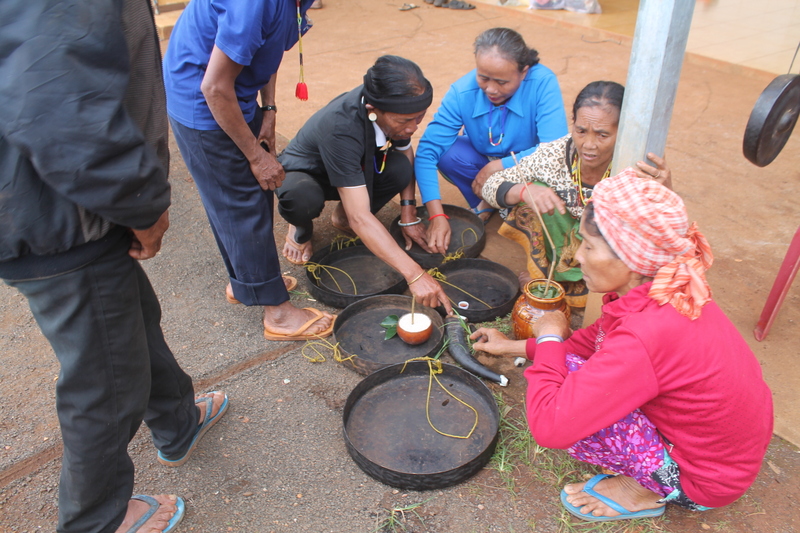 Big Nong can’t be used in the normal ceremonies such as weddings or exhibitions because it is a taboo of the Bunong people. But the other 5 instruments can be played in these normal ceremonies. Choeng, Gong and Nong are believed by Bunong people to have spirits residing in them. 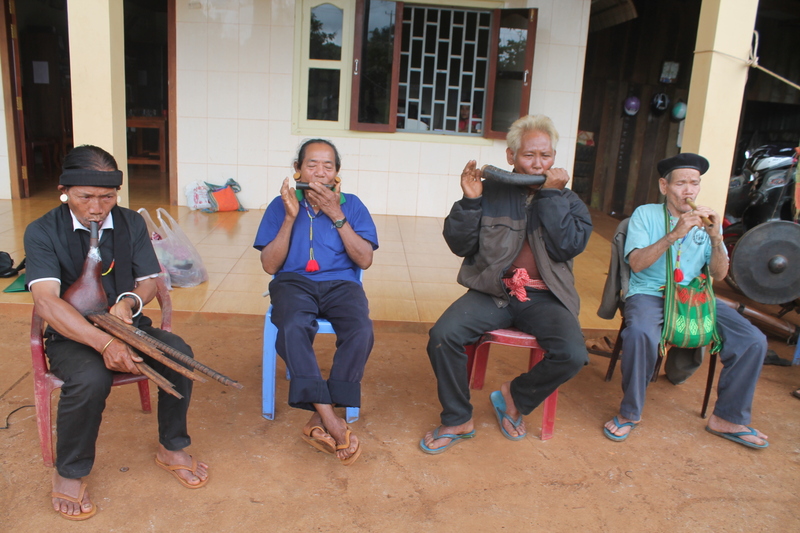 These three type of Bunong musical instrument can’t be play without first having a celebration ceremony for them. Some instruments can be played by one person such as the Rahome, Kong Reng, Mapoartt, small Nong and big Nong but some have to have a band of 6, 8 and 12 people to play them, such as Choeng which needs to be played by 6 people and Gong which needs to be played by 6, 8 or 12 people. Some instruments can be played alone or played together with other instruments in the ceremony. But some instruments have to be played alone. There have been some changes in how Bunong musical instruments are used now compared to how they were used in the past.. Some instruments were not used in Bunong ceremonies. For instance, during the rice collecting season, gongs had been played while Bunong people were travelling from their farm to their home and even when they were resting on the way back home. Then, more recently Bunong people haven’t used the gongs. Moreover, some instruments were used only for entertainment purposes in their traditional events such as rice ceremonies, weddings, happy new year etc.,. They were never played for or shown to tourists like they are today. Furthermore, some melodies have been lost or forgotten. Pech Pel, which is played by Kong Reng, for example has been lost. Some instruments, such as big Nong and Mapoartt are not produced because there is no longer anyone who knows clearly how to produce it. There are not many people who can use them correctly and it has been hard to find them recently. This loss could be because the elders didn’t have enough time to play them as they were too busy with their farm work and this knowledge has never been documented or recorded before. But recently we have continued documenting, preserving and practicing this knowledge. Bunong’s musical instruments are completely different from Khmer’s and they can’t be played mixed together with Khmer’s musical instruments. Click here: to listen to our Bunong music.